Carrie Underwood and her husband, Mike Fisher, just welcomed their first child together, a son named Isaiah Michael, in February 2015, and it seems like life is going just splendid for the first-time parents. The singer recently took to her Instagram to post an adorable photo of the two guys in her life taking a nap together while she had band rehearsals. It definitely looks like Fisher is a supportive husband and loving father and that is awesome, because it's what Underwood deserves! I didn't know much about her husband, even after seeing him beside her at many events over the years. I only gathered that he was an athlete of some sort. 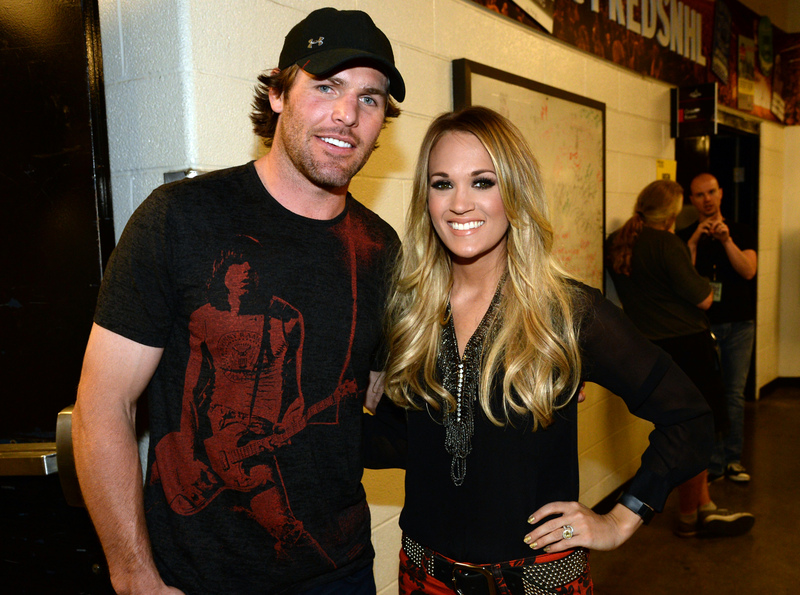 So, how did Carrie Underwood meet Mike Fisher? I imagine country singers and pro sports players don't necessarily cross paths. Love is a tricky and mysterious thing — a thing that can bring together an American Idol winner and a hockey player living and working in Ottawa, Canada. Thanks to her Behind the Music special in 2012, fans got the very cute details of how a friend decided to introduce the now-married couple and see if they would hit it off. Underwood's bass player in her band, Mark Childers, can be credited for their meeting, but the singer was not into the idea initially. As she explained on Behind the Music, "I mean, can I make dating more difficult? Let's get a hockey guy who lives in another country. Awesome." I feel you, girl. Underwood eventually obliged and suggested that she meet Fisher at a meet-and-greet for one of her concerts, that way, if she thought he was weird, she wouldn't have to deal with it and be totally awkward. If only I had the luxury of using this excuse to get out of some bad dates! She obviously didn't have to use any excuses during that meeting and ended up texting Childers that Fisher was "hot, hot, hot." Behind the Music also showed Fisher saying of Underwood, "First time I saw her, she was more beautiful in person than on TV." Awwww. Because of each of their busy schedules, they ended up speaking on the phone for almost three months before they even could meet again properly. Underwood said of their date, "That was good for us. Then our first real date was on New Year's Eve, and our first kiss was when the ball dropped." Umm, talk about epic and after that, it didn't take too long after for the two to get engaged at the end of 2009. In Canada, he was a big celebrity, so he knows what it's like living under a microscope. And he travels a lot, which is good for both of us. We're both independent people, so we can't have somebody around 24 hours a day, seven days a week. She continued, "We can go weeks without seeing each other... I don't have to worry about Mike. I don't think twice. He's going out? I don't care. It doesn't bother me. I don't bat an eye." It sure sounds like these two have their priorities in the right place and I see a bright future with their growing family ahead of them.